Henley Rowing Club (HRC) once again delivered some fantastic racing results making this season one of its most successful to date. Across two weekends of glorious racing, its junior squads won no less than 8 golds and 5 silvers at the National Schools Regatta 27th-29th May, cementing HRC as one the strongest junior clubs in the country. 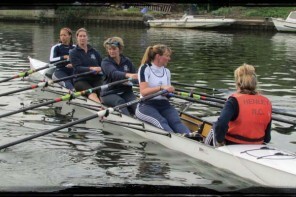 The National Schools’ Regatta is the largest regatta for juniors in Great Britain. 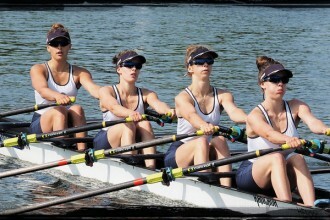 Held annually in May, the regatta offers events for Junior rowers between 14-18yrs. The regatta was first raced in 1947, and has since grown to what is a world class event enjoyed by clubs and schools across the United Kingdom. HRC was there in force, with representation in the age groups 14-16yrs. The event was run over three days and with over 3,500 competitors contesting 50 different events – so the competition for Henley was stiff. For the first time the regatta was held on the Olympic course at Dorney, providing world class facilities for the UK’s emerging rowing talent. 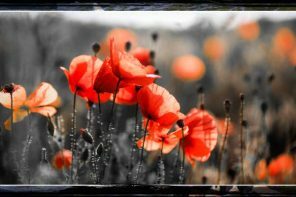 The weather for the 3 days was a typical British mixture of sun & cloud. The only thing to bother the crews was a slight cross wind that grew as the squads progressed to the finals. Nothing serious enough however to stop HRC’s winning ways. The Junior girls (14yrs) started the winning streak on Friday, with a win at their first ever National Schools Regatta entry. The ‘A’ crew of, Georgia Brown, Freya Jonsson, Amber Weller, Hazel Drury and Ella Shute (cox), beat 35 other crews to win gold by a huge 2 lengths margin in the final. 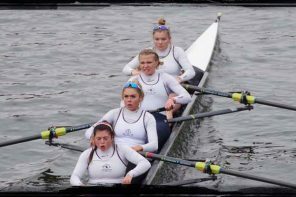 The ‘B’ crew of Jessica Roberts, Phoebe Snowden, Hanna Hills, Natalie Cooper and Freya Reid then continued to add to the medal tally, winning their final by about 100m, on only their first outing in this crew formation. This was also followed by a further x4 golds x3 silvers from the Junior girls squads (15 & 16yrs). Then came the turn of the Junior Boys. Tough determined racing from the Junior Boys (14yrs) ‘A’ crew of James Swinburn, Euan Turnell, Grant Taylor, Alex Carr and Charles Washbourn, resulted in silver medal position, as the crew powered through from 3rd position in the final 250m. The Junior Boys (14yrs) ‘B’ crew of Sam Beattie, Ed Roy, David Rechner, Charlie Garnham and James Penrose, dominated their races providing more golds for the club. The junior boys (16yrs) ‘B’ quad consisting of Jack Spiers, Tom Crook, Henry Peter and Lachlan Reid won silver – a strong result as three of the crew rowed a year above their actual age. Not content with just their victories at the National Regatta, HRC Junior Boys (Oliver Taylor and Balthasar Issa) went on to win a bronze medal in J15 doubles at the Junior Sculling Regatta at Dorney on the following Monday (30th May). There were many other victories for the club across the x4 days of racing bringing the tally to no less than 8 golds, 5 silvers and 1 bronze. The results were once again proof of the club’s tireless efforts to develop its junior squads and a further testament to the quality of the coaches and volunteers that enable these young rowers perform at the highest level.